Grist for your Paperbark Maple. Autumn is known for its wonderful colors, the yellows, oranges reds and maroons add a bright splash of excitement to the coming winter season. I enjoy the many native trees in the area with their amber shades. 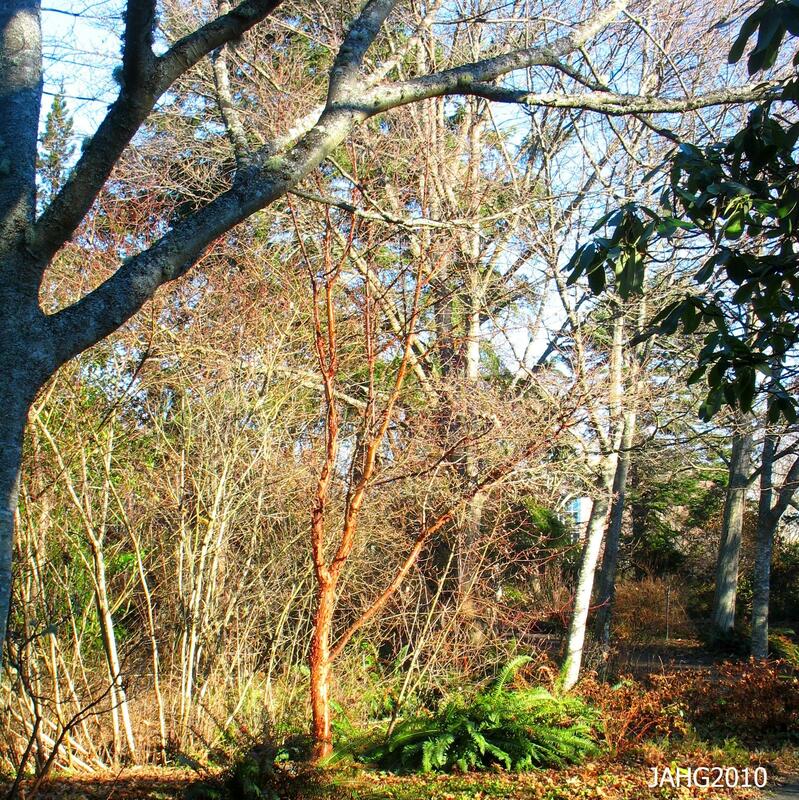 One somewhat rare tree which should become much more widely grown is the Paperbark Maple(Acer griseum) which has bright buttery yellow to crimson coloring. 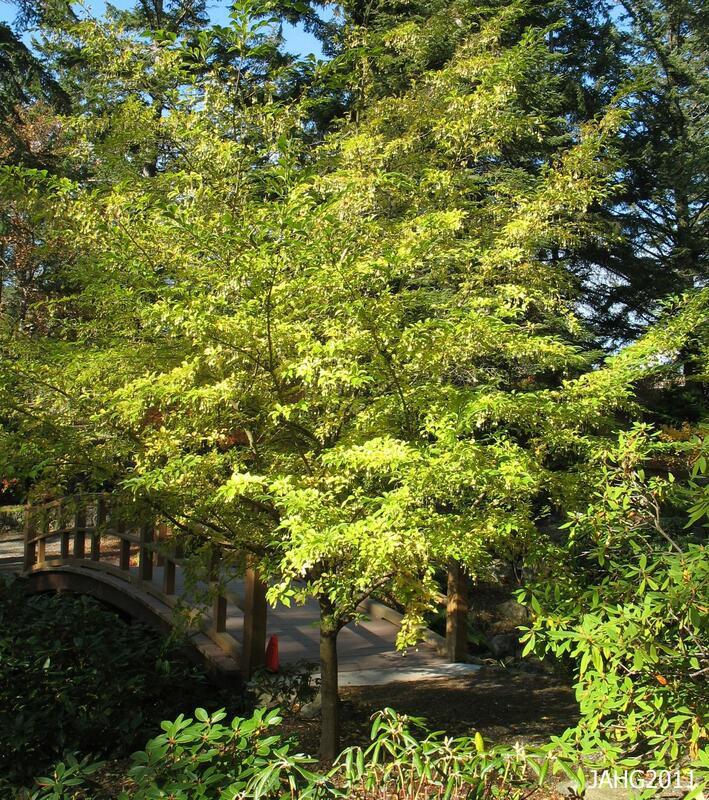 It is one of the best small specimen trees for a typical urban setting. Autumn color of the Paperbark Maple some of the latest in the year for the Maple family. The year was 1901 Paperbark Maple was introduced to Europe by way of Vietch’s Nursery. 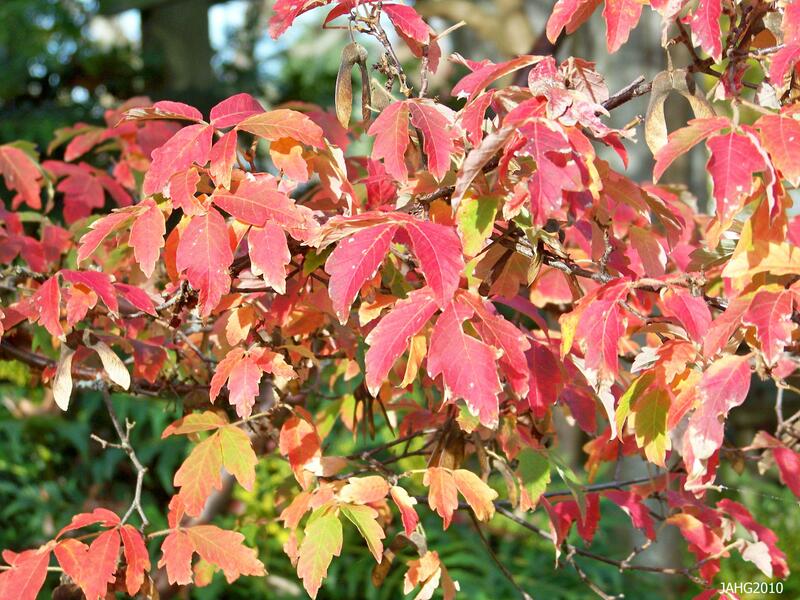 Acer griseum is another fabulous find by Ernest (Chinese) Henry Wilson. He was on one of his many explorations for plants in China looking for the famous handkerchief tree(Davidia involucrata) which was known but not collected at that time. The area he was exploring was central China. 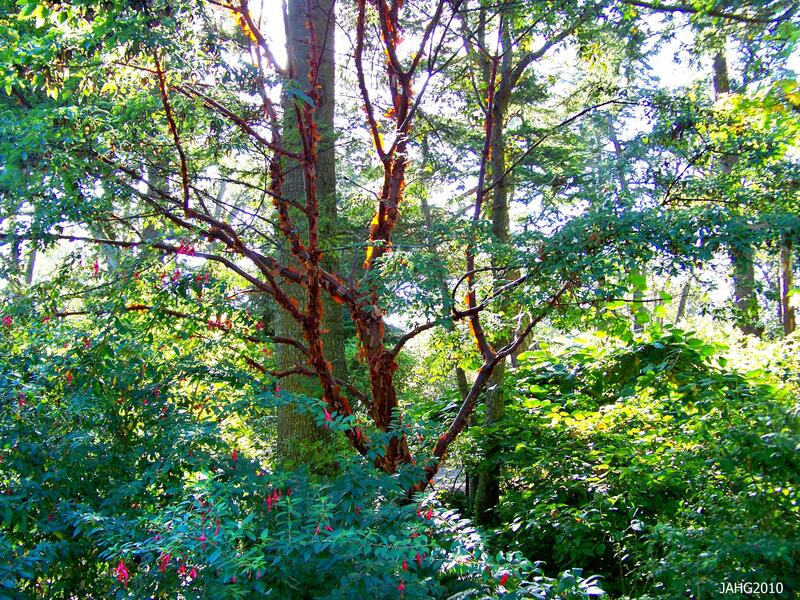 I can imagine Ernest 'Chinese' Wilson finding Acer griseum in the forest looking like this, bark glowing in the light. Paperbark Maples come from central China from north-east Gansu province traveling west into Hebei and south to Sichuan and south-west into Hunan. The tree is found at fairly high altitudes of 1500-2000 m. (5000-6500ft.). It is one of the better but not the most famous find of the over 1500 named plants which ‘Chinese ‘ Wilson brought to horticulture during his incredible explorations. The peeling 'paperbark' of Acer griseum is very beautiful throughout the year. Acer griseum does not have the typical ‘maple’ shaped leaves, instead it is trifoliate. This gives it a delicate feeling as the foliage looks fine in texture. Many people are not familiar with the other leaf forms of Maples. One similar leaved maple is the Box Elder(Acer negundo) which is extremely hardy and produces masses of seedlings making it become somewhat of a pest in many places. 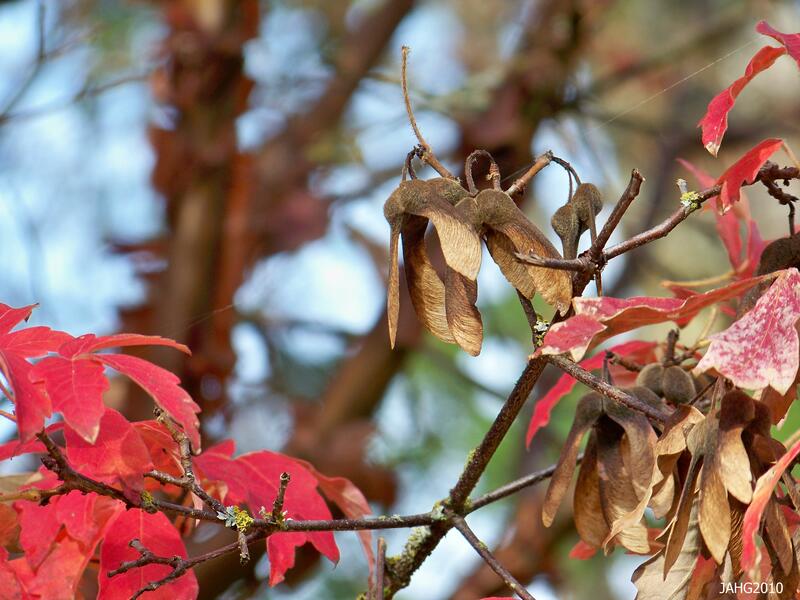 The delicate looking trifoliate leaves of Acer griseum come to life in flaming fashion in the fall. 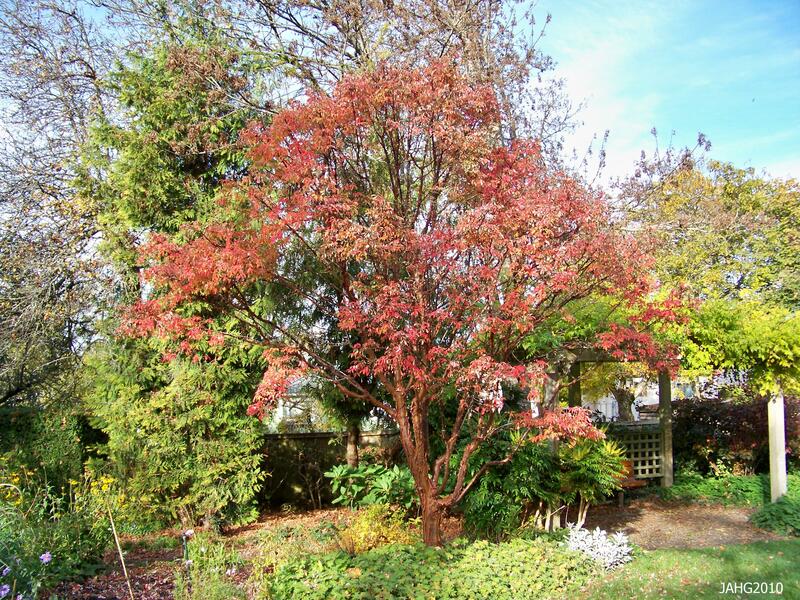 Acer griseum is an excellent small tree for the home and should be seen more often. One issue that has become known is the difficulty germinating the seed which is said to be between 2 and 8%. It produces a good amount of seed but most of it has proven to be parthenocarpic. Parthenocarpic is seed which developes but is sterile. 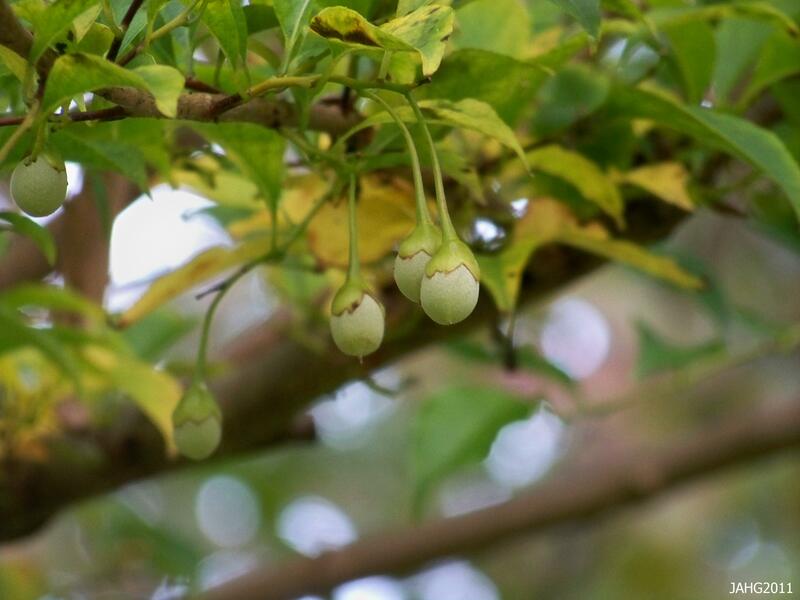 THere are now plans to make new collections of wild seed to increase the gene pool of this tree and increase the likelihood of better seed viability. Another issue is that these trees are androecious with males and hermaphrodite flower structures. Acer griseum produces a great amount of seed but little of it is viable. Acer griseum has many feature which lead it be seen as a specimen tree. It is attractive throughout the year; spring gives us delicate blooms and the flush of new leaves, summer is seen with the delicate green-blue of the leaves, autumn highlight the brilliant color late in the season and winter comes when the bark is highlighted especially with backlighting. The size of the tree is also especially appealing and works well in most garden situations whether they be in a border or by itself. 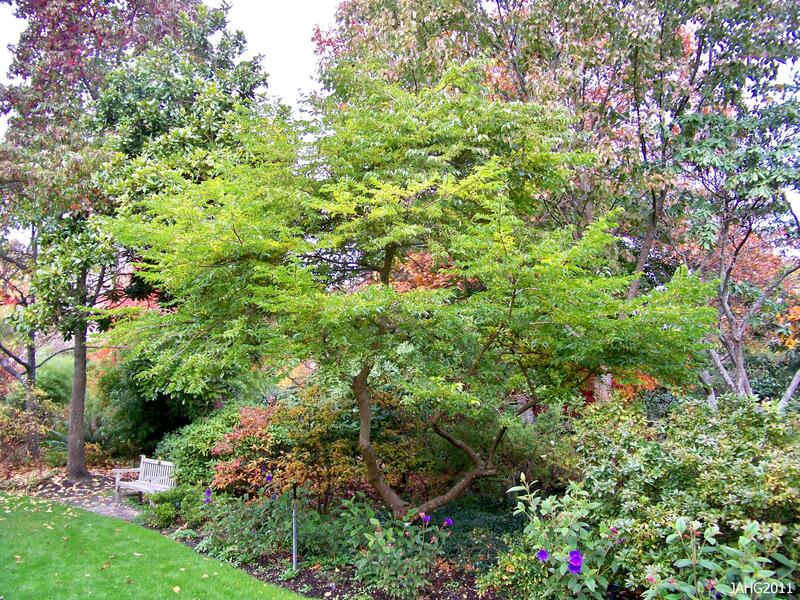 This wintery Acer griseum is found in Finnerty Gardens along a less traveled path where the bark is highlighted. Acer griseum grow in full sun to part shade but not deep shade. They like fertile acidic soil which is well-drained. They need average amounts of waster and are not noted to be drought tolerant. They have few pests or disease. They can be pruned but it is rarely done except for shaping or removal of damaged limbs and this is best done in late autumn or winter. They are slow-growing trees which can grow to 10-20 m (30-60ft). They are fairly hardy and are rated taking -20c(-4f) and higher. Paperbark Maples are easily transplanted. 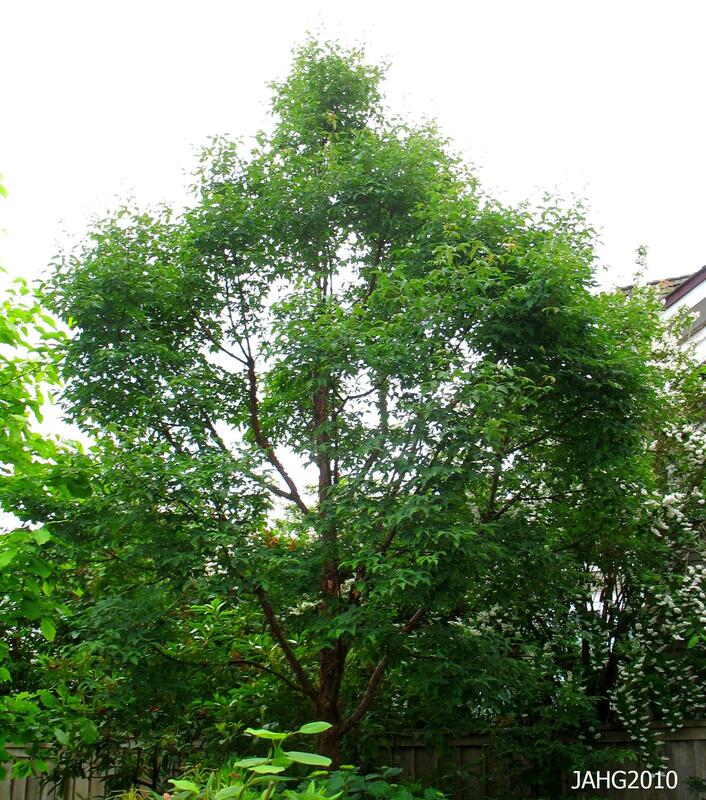 This Acer griseum is in the back yard of a garden in Vancouver. 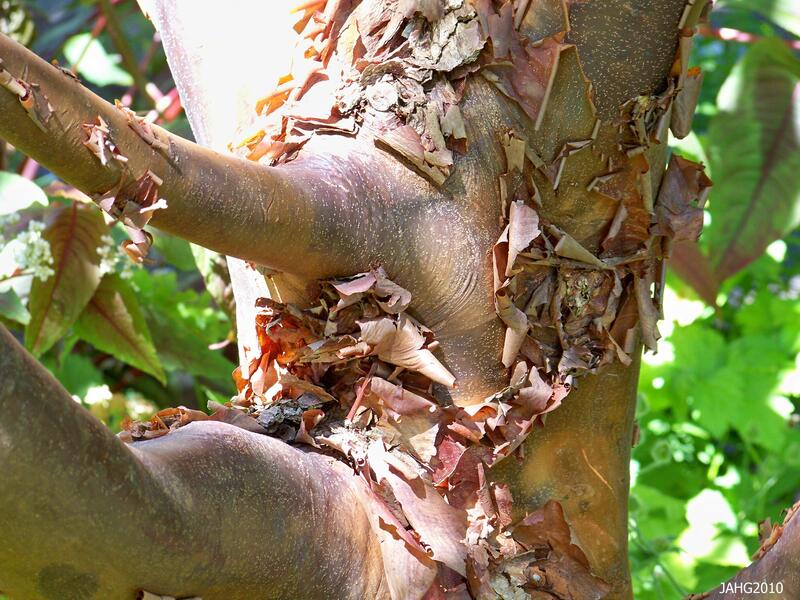 Paperbark Maples are propagated by cuttings or by seed and are somewhat rare in nurseries. They are becoming much sought after by good landscapers and gardens are more expensive to buy than many other trees. 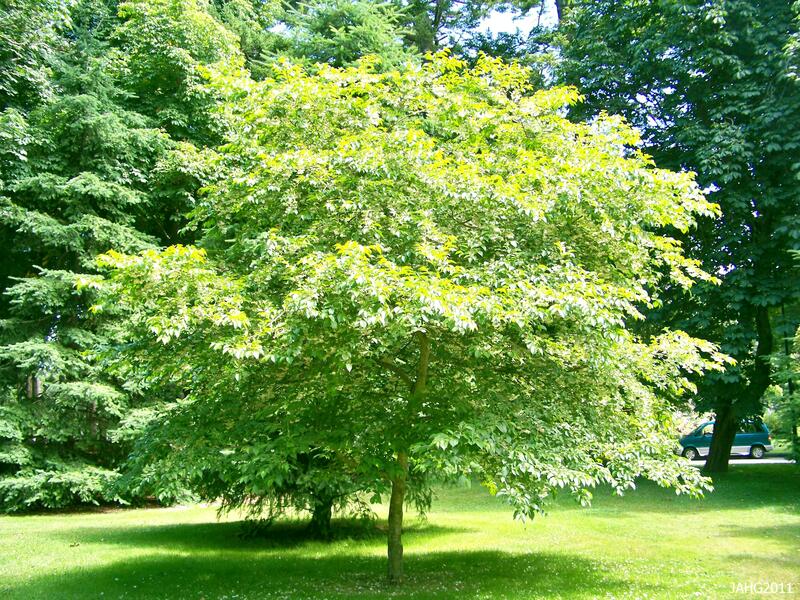 It is a tree I recommend for the small city gardens as a specimen or accent tree. ……I will be looking forward to seeing you again soon here….. This time of year, no matter where I am, up north in deep snow, down on the coast in the rain or somewhere else when the sun comes out I want to either work a garden or explore in the woods. This year the spring weather has come extraordinarily early and since I have recently moved I have started explore new areas in the city. My first stop was to change my library card and to explore Colquitz River Trail which runs along the river of the same name. I was hunting for the not so elusive Osoberry or Indian Plum(Oemleria cerasiformis)plants which are in bloom now, I stalked along the walk and …..alongside the path were several! 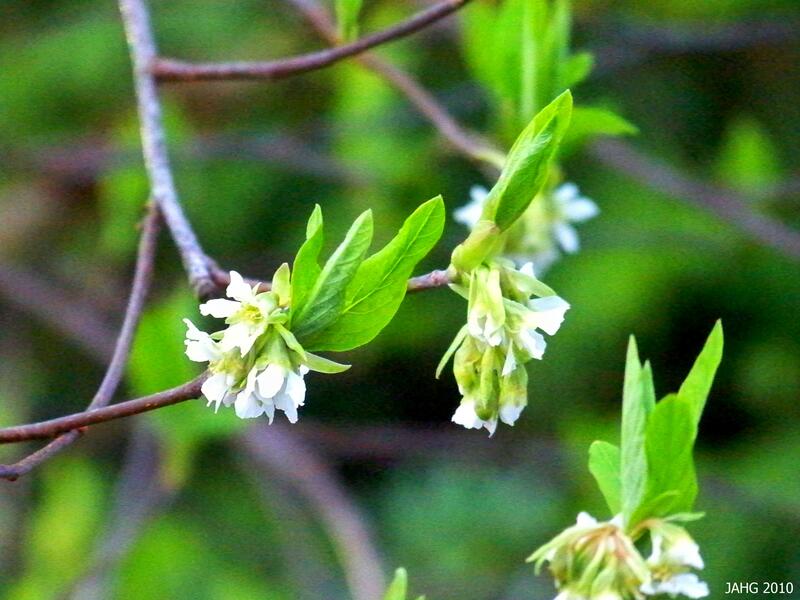 The Osoberry is one of the first native plants to bloom. On gloomy wet days when I go for a walk I see these shrubs with their glistening white racemes of pure white flowers which hang from the tips of branches like perfect dew drop earings. The Osoberry is a small tree or more commonly shrub which lives on the Pacific side of the coastal mountains, its range is from Santa Barbara County in U.S.A. north though into southern B.C. One of its common names refers to the fruit (fleshy drupes) which when ripe look like tiny thumb-sized Italian plums, and indeed they have stones which are also perfect miniatures of that fruit. The Indian Plum has plentiful fruits, but you better be quick to harvest them. The fruit is ripe when it is bluish black and was eaten by local native groups, they savored them fresh, cooked and dried. Oso(berry) refers to bears liking to eat them. Birds (Robins), squirrels, deer, coyotes and many other animals love to feast on the fruit as well. Let us not forget the bees which enjoy this early source of nectar. Indian Plums can be found in many parks here, this group is found by the bathrooms at Beacon Hill Park. Native people also used parts of the Osmaronia cerasiformis medicinally. Burned twigs were pulverized, mixed with Oolican grease and applied to sores. A tea made from the bark was used as a purgative and tonic. Decotions where made for tuberculosis. It is said to be not only anesthetic but an aphrodisiac as well. Osoberry is a member of the Rosaceae(Rose family) whos seeds often have small amounts of hydrogen cyanide in them. hydrogen cyanide from these types of sources has been shown to stimulate respiration and improve digestion if carefully administered by a professional. Colquitz River Trail is a good area to view Osmaronia cerasiformis. To my eye Osoberry are vase-shaped shrubs which are delicate looking throughout the year, this is partly do to the attractive thin leaves which keep their bright green coloring until the fall when they change to a clear butter yellow. It is not a densely leaved shrub therefore it never looks heavy or lumpy, but has a more wispy quality to it. In the winter without leaves the form of these shrubs can be highlighted. Finnerty Garden has done a wonderful job pruning their Osoberry into small tree forms. Osoberry is seen in many areas here, along paths, roadsides, meadow edges and creeks and in many rocky areas growing under the Garry Oaks. They are in full sun or dappled light. They like rich humusy soils which can retain some moisture during our dry summers here. if they become too dry during the summer they will start to drop some of their leaves. They take pruning very well and this should be done after they have bloomed. They usually are pruned for shape but also can be cut to the ground to revive them and tidy them up. Osoberry are male or female plants and often grow in thickets under Garry Oaks as seen here at Government House. 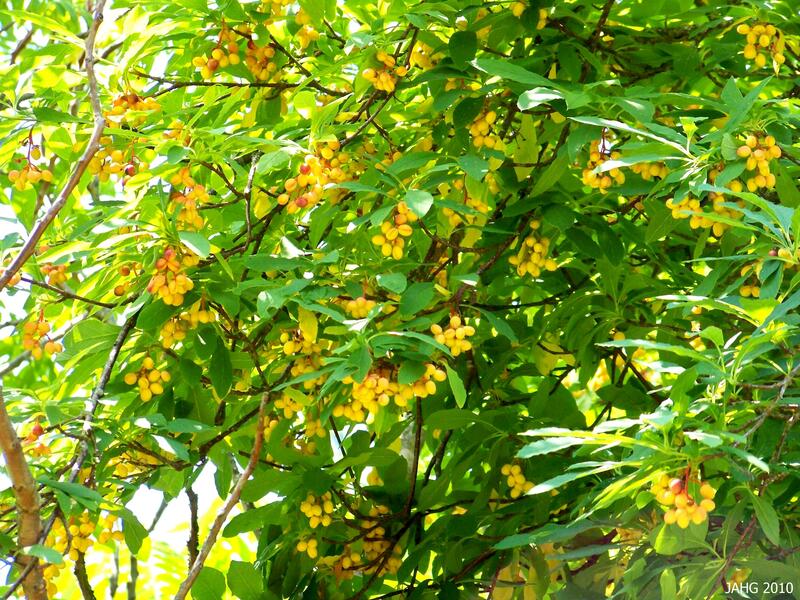 Indian Plum are male or female plants. If you want a good crop of berries for the wildlife or you, you will have to have both sexes of plants. I have seen incredible crops of berries and have made tasty syrups and jellies which are similar to cherry flavor. These plants grow to 6m(20ft) high and 3.7m wide in places where they are most happy. They are rated zones 7 though 10, cold tolerant to -18c(10f). This unripe crop of Indian Plums is high above my head. In the Great Victoria we a blessed to have many parks and rural areas which we can explore, often the nearest ones are the places that are overlooked. I had been to Dominion Brook Park near where I live several times with my sister and her son to play and explore the large safe. It was only later when I took my father to see the park that I realized what interesting plants were there. In reading about the history of the park this is not surprising. It has one of the oldest plant collections in the area. It dates back to 1913 when it was established by the then Canadian Department of Agriculture as a demonstration arboretum and ornamental garden for the public to enjoy. 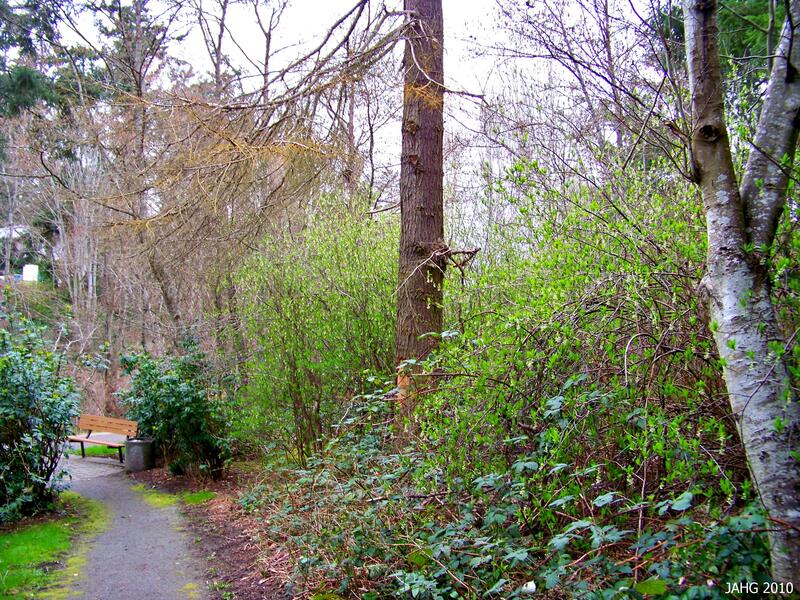 Dominion Brook Park in North Saanich. Dominion Brook Park still has significant collections of conifers, Hollies, Camellia and Rhododendrons which were imported from some of the most famous nurseries in the world. If you go to the park at this time and look across the main pond you will be surprised to see a fiery red Rhododendron blooming and sometimes reflected in the still water. This is one of the original Rhododendron which was brought from Arnold Arboretum by Ernest ‘Chinese’ Wilson to give to the new park. The red Rhododendron strillgilosum is one of the species he discovered in his plant collecting trips in China which he became famous for. Brillant Red Blossoms of Rhododendron strigillosum. Rhododendron strillgilosum overlooking the pond at Dominion Brook Park. Rhododendron strigillosum is a dramatic sight to behold at this time of the year and is a break from all the yellows, whites and other pastel colors that seem to dominate now. The red coloring stands out from the other early blooming rhododendrons such as sutcheunense(pink), dauricum(mauve) and moupinense(white to pale pink). the species is not too common to find and you will have to look in an specialty garden or collection. What is common are the hybrids from this strigillosum which bear definite resemblance to the parent and several have become famous in their own right. 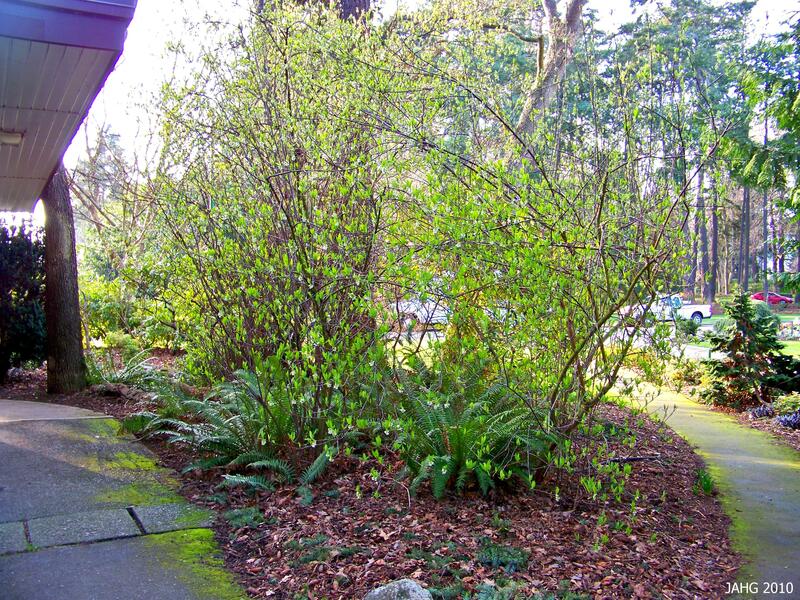 Etta Burrow, Grace Seabrook, Malahat, and Taurus are but a few which are commonly seen in gardens in this area. Rhododendron strigillosum is Loaded with Blooms. Rhododendron stigillosum is easy to recognize as is a large rounded shrub or small tree which can grow to 25ft in a suitable location. It has long elliptical leaves with edges that are often rolled under. Looking more closely at the leaves, bristles which are reddish are seen coating it. These bristles are most noticeable on new growth as well as on the branches. This plant is found in the provinces of Sichaun and Yunnan, China at 7 to 11,00 ft( 2100-3400 m). 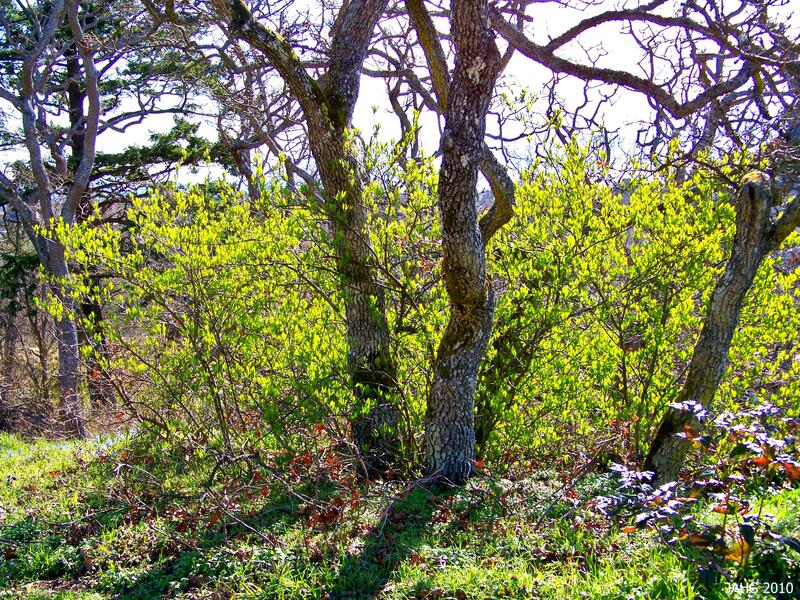 It was introduced to Arnold Arboretum by E.H. Wilson in 1904. It was award an AM (Award of Merit) in 1925. Rhododendron strigillosum in Finnerty Gardens. Rhododendron strigillosum and it’s hybrids are all easy to grow. Like all rhodos’ they like rich well drained soil with some extra organic material added early each year. Rhododendrons are shallow rooted therefore it is especially important that they are watered throughout the year. Next years flower buds are being set in late summer when we often have an extended dry period, if watering is neglected it will effect blooming the following spring! Rhododendron are usually forest dwellers and show their displeasure at being exposed to too much sun by having yellowed leaves, dappled conditions are prefered. These are fairly hardy plants and tolerate temperatures down to 5-14f (-10 to -15c). for short periods. A Very Un-Dogwood Like Bloom. I Remember when I was going college I walked every day to get the the bus. I used this time to learn the 300 or so plants which were required for me to pass the program. Fortunately in the few blocks to the bus stop there were many plants on the list. As the seasons progressed I saw the changes that occurred with each of the plants I studied from fall, through winter and into spring. I would never have noticed the bushy shrub-like tree which I stood in front of every morning until it burst into bloom at this time of the year. To my delight it was a Cornus mas or Cornelian Cherry Dogwood which produced a spectacular golden display before most other plants are in bloom. I never saw another one until…. I regularly visit the Glendale Gardens and found several in bloom, WOW is all I can say. This year since I knew I would write about Cornus mas I have been on the hunt for others and have struck several golde(en) bonanzas. I looked in the usual places and was not disappointed, two at Government House and two at Finnerty Gardens. A Huge Cornelian Cherry Dogwood on corner of Trutch St. and Fairfield Rd. The real surprise was on the way to Government House driving along Fairfield Road. I saw an incredible huge example at the corner of Trutch Street. and Fairfield Road. I am so glad to find a Cornus mas that is on a street side instead of of a park or fancy garden. This is a highly traveled site that anyone can go by and enjoy the beauty of this tree. 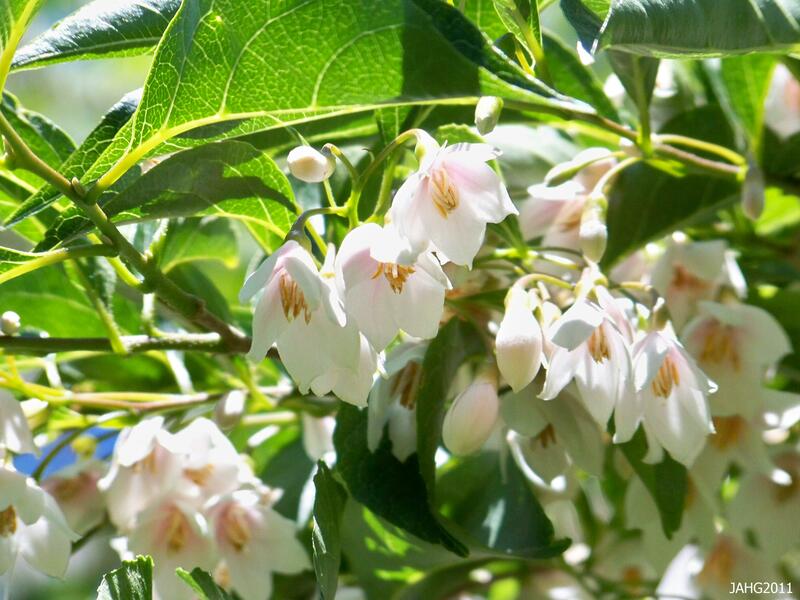 This wonderful plant comes from central and southern Europe and also is found in Western Asia where its large ‘cherry-like’ fruit is used for making jams and sauces. In Armenia the fruit is added to Vodka to flavor it. The deep red ripe fruit is an oblong drupe which is up to 3/4in. long by 1/2in wide and contains a large stone. 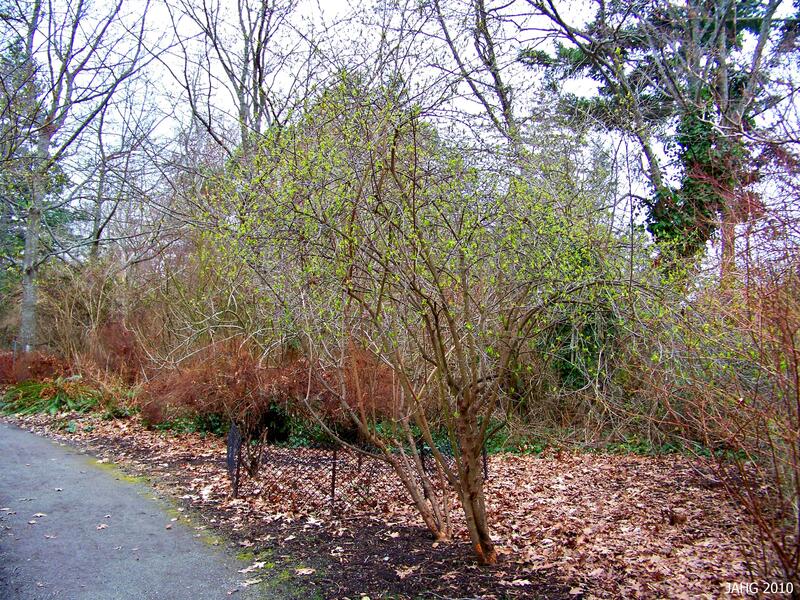 Several Cornelian Cherry Dogwood cultivars have been selected with unusually large fruit for commercial production. Cornus mas clad in its Summer Suit at Glendale Gardens. The best thing about Cornus mas is that it is easy to grow and will fit into many planting schemes. 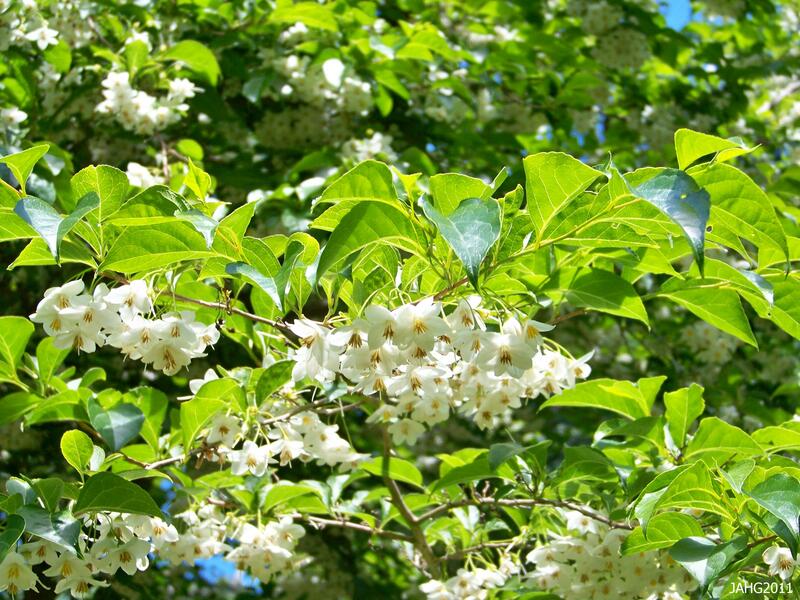 It works well as a specimen or in a winter garden, in a natural or woodland setting. As it has a small stature of no more than 25ft by 15ft it will fit well into many small urban gardens. It also looks good in small feature groups or in a mixed shrub border where its bright flowers will standout from the dark background. Attractive mid-green foliage of Cornus mas. It is the least fussy of the large Cornus (Dogwood trees) and will tolerate any soil from dry to quite wet. It grows best in full sun to part shade which is especially needed in hot drier climates as the leaves are thin and loose moisture easily. Cornus mas plants take pruning very well and is often shaped into a several stemmed small tree which helps to show off the attractive flaking bark. Well pruned Cornus mas showing the attractive bark. 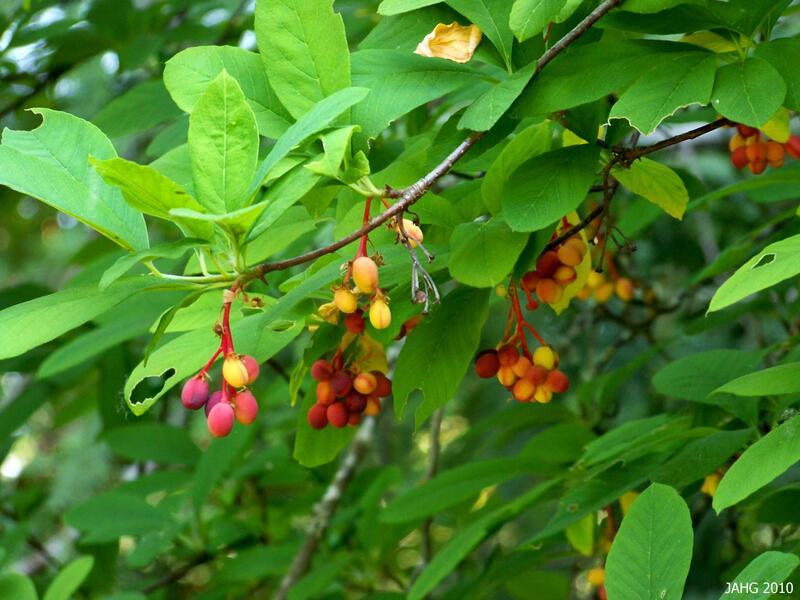 There have been several well known forms of Cornelian Cherry Dogwoods which may be available in your area. ‘Aurea’ with golden leaves, ‘Variegata’ which is edged in cream and ‘Elegantissim’ with pink or golden highlights are some of the foliage forms. There are also golden and white fruited forms known. On top of these there are pyrimidal, dwarf and extremely cold hardy (‘Ukraine’ tolerates -30f.) selections available. Zones 5 through 8. Until we meet again on Wednesday for a new clue and the start of a new story.